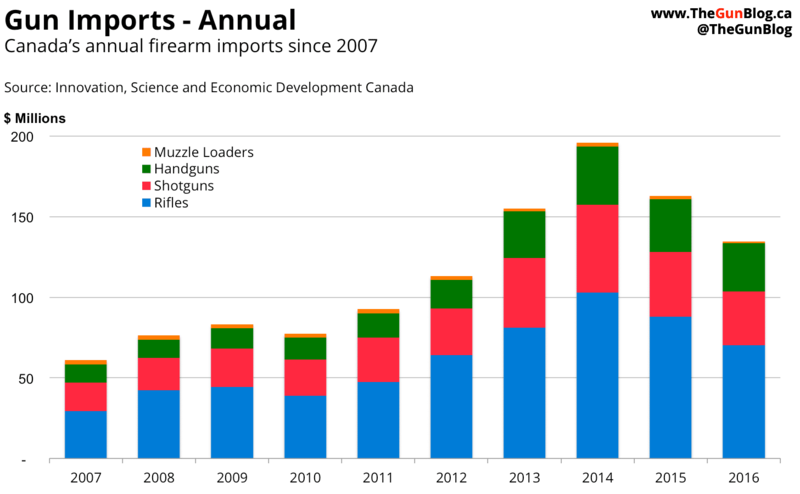 Canada’s gun imports surged in the first quarter as companies stocked up to shield themselves from government import rules that take effect June 1 and threaten to hurl the industry into a crisis. The government said it’s planning an update soon. The value of guns that entered Canada climbed 30 percent to $43.8 million in January to March of this year from $33.6 million in the same period of 2016, according to the government’s Trade Data Online. March alone totalled $19.1 million, the highest level in at least 24 months. Imports rose for five consecutive months through March, the longest stretch of gains in at least two years. “This is in direct response to the pending firearms regulations,” Alison de Groot, managing director of the Canadian Sporting Arms and Ammunition Association (CSAAA), the main industry group, said by telephone on May 8. The government’s so-called UN firearm-marking regulations require companies to mark “Canada” or “CA” and the last two digits of the year of import on all guns that enter the country starting June 1. Import rules are critical for Canada’s firearm industry and for every shooter and hunter because almost all the guns sold in the country come from abroad. The industry faces hurdles in addition to the import rules. Canada’s currency has lost a third of its value against the U.S. dollar in the past five years and retreated against the euro, reducing the appeal of foreign goods. High unemployment, especially in the energy sector, is forcing some shooters to cut spending on new gear. 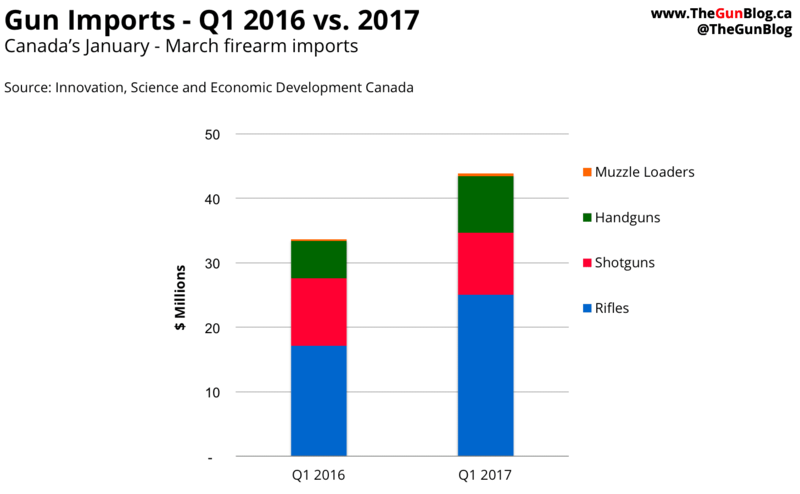 Under normal business conditions, the level of imports indicates the health of Canada’s gun industry, the outlook for demand and the availability of U.S. supply. Companies import more when they expect demand to increase, or when supplies become available. Companies import less when they expect demand to decrease, or when they can’t get all the guns they want. More than half of Canada’s firearm imports come from the U.S., and some distributors serve their home market before shipping to Canada. The gain in first-quarter imports may have been boosted by U.S. companies looking to Canada to buy their excess stock because purchases have dried up since Donald Trump was elected president in November. The preceding months had seen a buying frenzy on concern Hillary Clinton would win the presidency and restrict firearm buying. Korth Group Ltd., one of Canada’s biggest firearm distributors, forecast a “strong year” of business for 2017. The number of firearm licences rose to a record at the end of the first quarter, further pointing to a good year for the industry. The value of imports has doubled in the past decade and rose to a record of almost $200 million in 2014, before plunging in 2015 and 2016 as the currency weakened and oil-industry workers were laid off. Companies have imported $1.13 billion of guns in the past 10 years. Handguns have been the hottest item (+169%), followed by rifles (+139%) and shotguns (+88%), while muzzle loaders have slumped by more than half (-60%). If current trends persist, handgun imports will overtake shotgun imports this year for the first time. Rifles: +46% to $25 million. Increases from the top three countries: U.S., Japan (Browning and Winchester?) and Finland (Tikka?). Shotguns: -8% to $9.6 million. Imports fell from all the main countries. Handguns: +50% to $8.8 million. From Czech Republic more than tripled (CZ? ), from Austria more than quintupled (Glock?). Muzzle Loaders: +105% to $0.4 million. Spain dominates this generally shrinking market. Data sources: Trade Data Online and Canadian Importers Database on the website of Innovation, Science and Economic Development Canada. Imports into Canada may not mean that the end consumer was in Canada.